Féile na Tuaithe, the festival of the countryside, takes place this weekend in the National Museum of Ireland - Country Life in Co. Mayo. Féile na Tuaithe 2010 takes place on Saturday 22nd and Sunday 23rd May from 12pm to 5pm. Admission and parking plus all demonstrations and workshops are absolutely FREE of charge. Everything within Féile na Tuaithe has a connection with country life, in keeping with the Museum's theme. Threshing demonstrations with Mayo North Old Engine and Tractor Club are new this year as are the wildlife walks in the Museum grounds. Gardening and growing your own is a special focus for 2010. Tips, demos and practical information will take the fear out of vegetable growing for aspiring gardeners of all ages with an emphasis on organic growing. Country sports are also represented, with birds of prey from Eagles Flying and gundog displays and competitions with the West of Ireland Spaniel Club. The festival focuses on everything that's good in traditional country life and presents it all in a fun and accessible way for children of all ages. Visitors get a chance to try their hand at traditional activities including sean nós dancing, bushcraft, candle making and spinning - or watch skilled blacksmiths and tinsmiths at their crafts. It's a cornucopia of action and activities, for all age groups, but with a particular family focus. Demonstrations and family-friendly activities run non-stop and the excellent food and craft marquees attract crowds from start to finish. For the first time a public photo competition "Capture Feile" will take place over the two day festival with prizes in a selection of age categories. 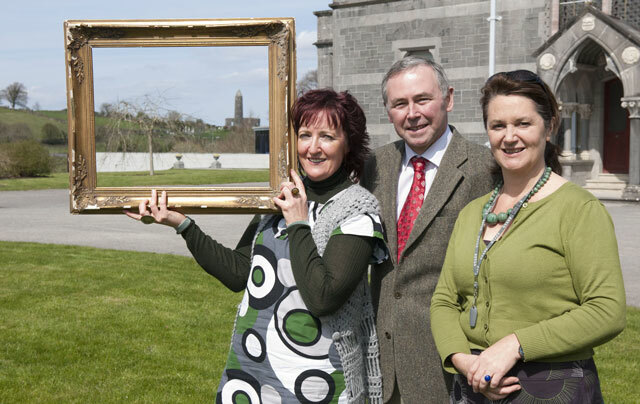 Launching the annual Feile na Tuaithe celebration of rural life at the National Museum of Ireland - Country Life, Castlebar, Co Mayo are (L-R): Angela Campbell, Kodak Express, Castlebar; Dr Tony Candon, Manager-Keeper and Deirdre Power, Head of Education and Outreach, National Museum of Ireland - Country Life. This year's event will invite the 20,000 visitors expected to attend to 'Capture Feile' in a new photo competition. Feile na Tuaithe is a FREE family festival taking place at the Museum on Saturday, May 22 and Sunday, May 23 from 12-5pm. See www.museum.ie for details. Photo: Michael McLaughlin. Féile na Tuaithe 2010 takes place on Saturday 22nd and Sunday 23rd May from 12pm to 5pm. Admission and parking plus all demonstrations and workshops are COMPLETELY FREE. A free shuttle bus service to Féile na Tuaithe will operate on the hour from Castlebar library, from 12pm to 4pm. The service will return from the Museum gates to Castlebar library on the half hour from 1.30pm to 5.30pm. Those travelling to Féile na Tuaithe are invited to park their cars in Castlebar and avail of the shuttle bus.